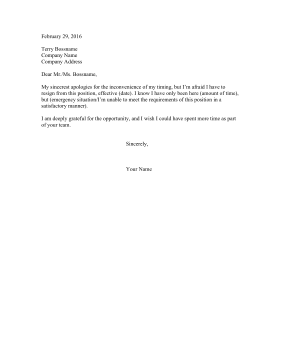 It can be awkward when resigning from a new job, but this printable resignation letter makes it easier. My sincerest apologies for the inconvenience of my timing, but I'm afraid I have to resign from this position, effective (date). I know I have only been here (amount of time), but (emergency situation/I'm unable to meet the requirements of this position in a satisfactory manner). I am deeply grateful for the opportunity, and I wish I could have spent more time as part of your team.